Do you suffer from drooping eyelids and do they make you tired quickly? Do your drooping eyelids give you poor vision? Or are you unhappy with your eyelids, do they make you feel insecure and unattractive? Blooming Clinic has the solution. Thanks to our eyelid corrective surgery, the above complaints can be rectified and you can confidently get on with your life. This page contains all the information about this treatment, including follow-up care, risks & complications, rates and our specialists. Do you want more information, do you have a question, or would you like to make an appointment with Blooming Clinic? Please fill out the contact form on this page. The Blooming Clinic plastic surgeons have vast experience in the field of eyelid corrective surgery. The eight plastic surgeons work closely together and share their cosmetic surgery experience, including their experience of eyelid reconstructive surgery. Every year, more than 1000 eyelid corrective surgeries are performed. Elsevier magazine has declared them best plastic surgeons in the Netherlands on four separate occasions. You are more than welcome to come to Blooming Clinic for an informative consultation about the type of eyelid corrective surgery that best suits you. A number of different types of surgery can be carried out around the eyes. The excess skin from the upper eyelids and the lower eyelids (bags) can be corrected, but sometimes the sagging muscles need to be corrected as well in the case of so-called eyelid ptosis, for example. There are many techniques to achieve the best result possible. For example, fat can be transferred, fat can be removed, small pieces of muscle can be removed, and structures can be fixed in order to gain stability. Everybody is different, and anatomy is never the same, not just when comparing individuals but also when comparing one half of the face with the other. That’s why the Blooming Clinic plastic surgeons carry out a thorough investigation to understand the make-up of your eyes and to make a plan for the surgery. However good the result will be, there are always disadvantages to surgery. For example, general risks associated with a surgical procedure such as secondary bleeding and wound infection. Fortunately, these complications are uncommon, but it is important to be aware of the risks before surgery. So, ensure you are well-informed about surgery. The better-informed a patient is about the pros and cons, the better they can decide whether the risks of surgery are worth it. Upper eyelid corrective surgery is typically performed under a local anaesthetic. Excess skin will be marked carefully beforehand. This skin will be removed. The scar will be in the natural fold of the upper eyelid and hardly visible. The sutures are placed subcutaneously and fixed with adhesive plasters. These will remain in place for a week. After the procedure, which takes about 45 minutes, the area will be cooled with cooling glasses. Swelling can occur after eyelid corrective surgery. We recommend that, during the first couple of days after the surgery, the eyelids are kept as cool as possible. This can help to reduce swelling and pain. After 5-7 days, the sutures can be removed. It is then advisable to apply scar cream to the scar. Your treating physician will be able to provide you with information about this. Upper eyelid corrective surgery can result in secondary bleeding or wound infection. In most cases, this will not be serious, but it may slow the healing process. The result of the surgery lasts for a long time, which means it will be visible for years. The above complications will disappear over time. Eyelid corrective surgery will only be reimbursed in certain situations. The cost of eyelid corrective surgery may be reimbursed by your health insurer if it can be linked to a medical problem. Or the loosening of the muscles around the eye. 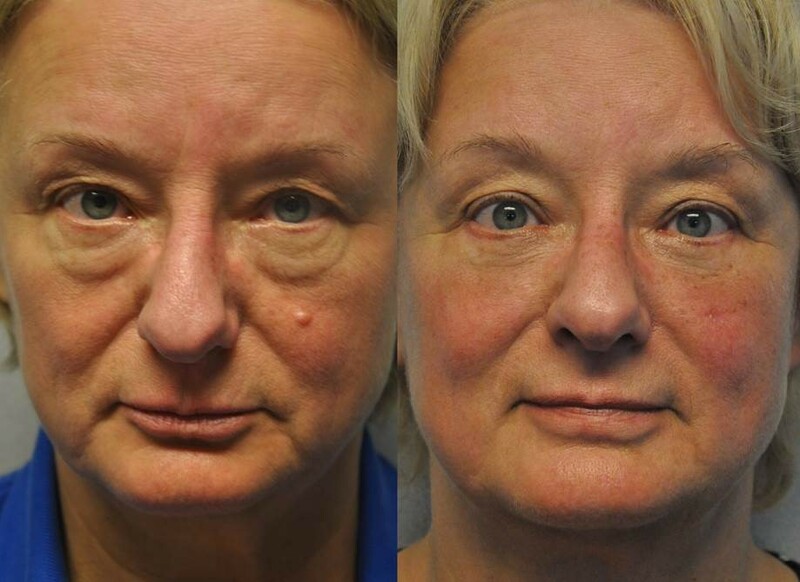 Lower eyelid corrective surgery can be combined with upper eyelid corrective surgery. I had a very positive experience with the surgery and result is wonderful. The staff were extremely knowledgeable and experienced. I was put at ease by both the doctor, as well as the very friendly assistant. During the treatment, a small incision is made under the lashes of the lower eyelid. As well as the removal of excess skin, excess fat can also be removed or relocated. The combination of removing or relocating the fat and tightening the skin provides optimum results. The remaining scars are barely visible, even shortly after the procedure. Just as with upper eyelid corrective surgery, the eyelids should be kept cool after the surgery. This can help to reduce pain and swelling. Additionally, Blooming Clinic recommends plenty of rest for the first few days after the surgery. This helps to restore the eyelids and ultimately, ensures the best result. After 5-7 days, the stitches will be removed. There is a very small chance of secondary bleeding after the surgery. In this situation, you may experience increased pressure in the eye socket. The complaint can be accompanied by severe pain and a possible reduction of vision. Generally, these complications are very rare. However, if you suffer from these complications, you must contact the plastic surgeon immediately. Another rare complication is ectropion. This means that the inside of the eyelid curls outward. You will be unable to close your eyelid properly, and this can lead to irritation and a flow of tears. A new surgical procedure may be necessary. However, we are happy to report that this complication is also very rare. 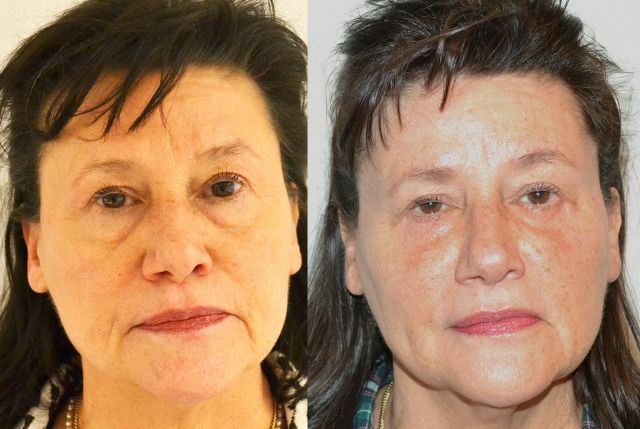 Thanks to its team of experienced specialists, Blooming Clinic has acquired a wealth of experience with both types of eyelid corrective surgery. Despite our expertise and experience though, we believe it is important that the client is always aware of the risks and possible complications. If you have any further questions after reading the above information, please feel free to contact us. We provide a fitting answer to every question. Lower eyelid corrective surgery is seen by health insurance companies as a cosmetic procedure and will not be reimbursed. I am very pleased with the end result and the entire procedure. I feel much better and look years younger – thanks for looking after me so well! During my research I came across Clinic Blooming. Thanks to their good ratings and BIG-registered doctors, I signed up for an intake. I had my intake with Dr. Staudt and it immediately felt right. During the appointment he listened carefully to what was bothering me and what my hopes were. Dr. Staudt took everything carefully into consideration and showed me what an eyelid corrective surgery could mean to me. Even though I got excited right away about the possible result, I was a little bit anxious about the actual surgery. Through a comprehensive explanation of the anesthetic, treatment and care after the surgery Dr. Staudt painted me a complete and clear picture of the total process. I left the clinic feeling understood. I was already confident I wanted to go through with the procedure before leaving the clinic. I made the following appointment shortly thereafter. The nurses were very nice and made me feel at ease. Before the treatment Mr. Staudt visited me and explained the entire process to me again to make sure I went into the surgery feeling comfortable. As it turned out all my anxiety was completely unnecessary! The surgery went really well and afterwards I felt very little pain. My eyelids were a little swollen but other than that I felt hardly anything. A week and a half after the surgery I went back to the clinic to remove the stiches. I was stunned by the improvement and would like to share the result with you. Thanks to the surgery I feel much more energetic, feel less pain and can see 100% again. Team Blooming, thanks for this result and all good care. Acquaintances of my parents explained to me that an eyelid corrective surgery could make a great difference. In addition they had experience with a good clinic that has their focus on giving excellent care to their patients. That is how I ended up at Blooming, the clinic performs different plastic surgery treatments and on their website they showed several good results. I was, off course, very curious what the procedure could mean for me. I made an appointment with Dr. Melis. A very nice doctor, who clearly explained to me what would change and which result I could expect. He painted me a realistic picture of the procedure which made me realize that this procedure could make a world of difference. At first I was afraid that I wouldn’t be able to see for a long time and that my eyes wouldn’t look good for a long time which was not at all true! Now (6 months later), I can, literally, look back at a positive experience with an even better result. My drooping eyelids have completely disappeared and I it’s like I have gotten a makeover. To anyone who experienced the same problems I did: Don’t wait too long and make sure you are well informed. I can highly recommend Clinic Blooming, it’s amazing! Last summer a friend advised me to make an appointment at clinic Blooming. He recognized my complaints and had good experiences with the clinic. Out of curiosity I went to a consult. Dr. Melis took all the time needed to extensively explain the process and showed me the possible result. He convinced me right away. On the day of the surgery he, again, made sure I was feeling at ease and I didn’t hesitate for a second. I barely felt any pain, do only thing I was able to feel were the injections. After the procedure I had swollen eyes for a few days but it still didn’t really hurt. It has been a number of months since the surgery. The only thing I regret about the procedure is not having it done earlier. The scars are barely showing, I’m completely cured of all my issues and often receive compliments about my fresh complexion. I highly recommend anyone who still doubts to do this procedure. Would you like to make an appointment with one of our specialists or do you have a question about the treatment of eyelid corrective surgery? Fill out the form below.